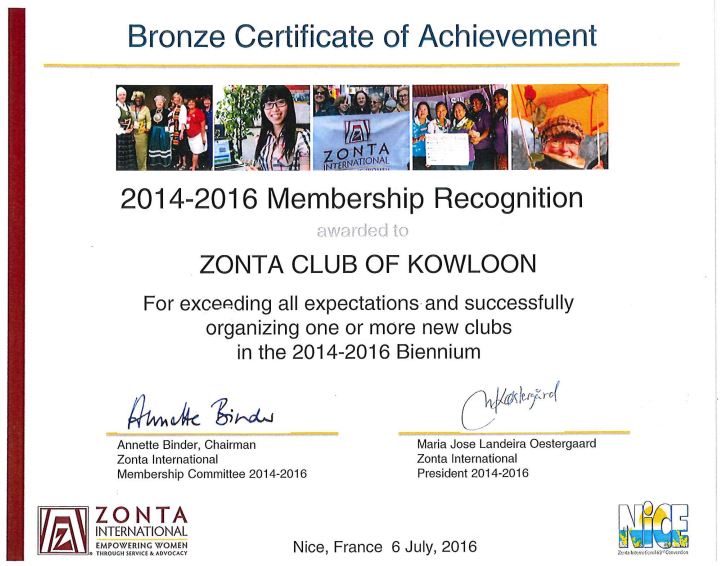 Founded in 1977, Zonta Club of Kowloon was the second club chartered in Hong Kong and celebrated its 35th anniversary in 2012. The club is a member of Zonta International, a global organization of executives and professionals working together to advance the status of women worldwide through service and advocacy. During the period 1 June 2016 - 31 May 2017, Margaret Leung joined us as from on 27 June 2016. The total no. of members was 50 as at 31 May 2017. The Growth rate 0%. During the period 1 June 2017 - present, 5 new members joined-Grace Kwok, Josephine Ip, Onyx Lau, Jasmine Li and Eunice Mak. Jasmine Li joined Zonta Club of Kowloon under "Young Professional Membership Category". Our Zonta Club of Kowloon has been awarded the Bronze Certificate under the new CONVICTION-COMMITMENT-COURAGE Membership Recognition Program of Zonta International in recognition of our Club's efforts and success as a SOM Club in organizing Zonta Club of Macau. On 6 July 2016, Area 2 Director Dr YC Choy represented our Club to receive the Award at Zonta International 63rd Convention in Nice, France.